Invent mythology PAMPERS, CHEER, AND OIL OF OLAY. These are just a few of the products that make Procter & Gamble (P&G) a legendary marketer. 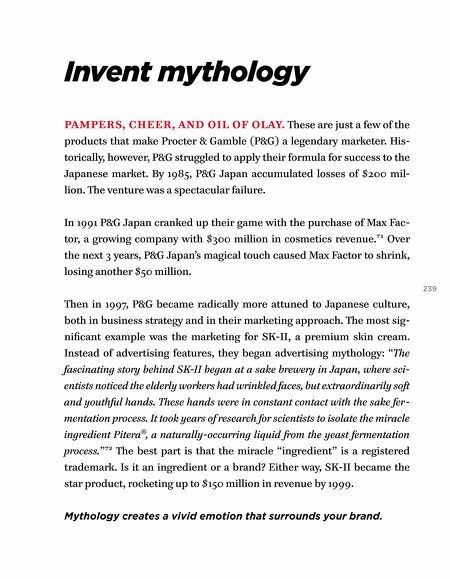 His- torically, however, P&G struggled to apply their formula for success to the Japanese market. By 1985, P&G Japan accumulated losses of $200 mil- lion. The venture was a spectacular failure. In 1991 P&G Japan cranked up their game with the purchase of Max Fac- tor, a growing company with $300 million in cosmetics revenue.71 Over the next 3 years, P&G Japan's magical touch caused Max Factor to shrink, losing another $50 million. 239 Then in 1997, P&G became radically more attuned to Japanese culture, both in business strategy and in their marketing approach. The most sig- nificant example was the marketing for SK-II, a premium skin cream. Instead of advertising features, they began advertising mythology: "The fascinating story behind SK-II began at a sake brewery in Japan, where sci- entists noticed the elderly workers had wrinkled faces, but extraordinarily soſt and youthful hands. These hands were in constant contact with the sake fer- mentation process. It took years of research for scientists to isolate the miracle ingredient Pitera®, a naturally-occurring liquid from the yeast fermentation process. "72 The best part is that the miracle "ingredient" is a registered trademark. Is it an ingredient or a brand? Either way, SK-II became the star product, rocketing up to $150 million in revenue by 1999. 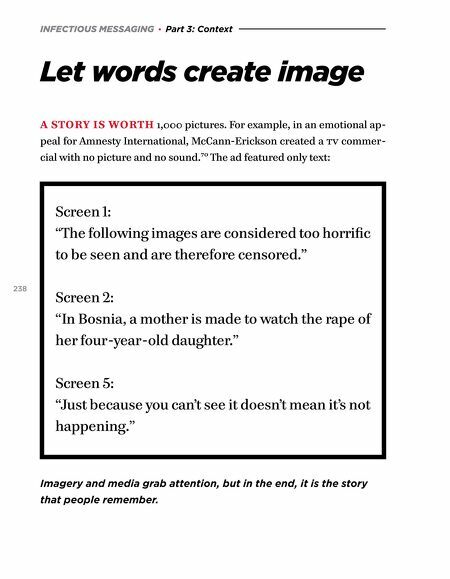 Mythology creates a vivid emotion that surrounds your brand.